Here's where you can buy the complete series: Firefly: The Complete Series [Blu-ray]. Here's where you can buy the animated series: Transformers: The Complete Series. Here's where you can find the trilogy: Back to the Future: 25th Anniversary Trilogy [Blu-ray]. The semifinals are here for the Ultra Hyper Hero Battle Mark I on Wattpad that my character Vecto is in, and Vecto has already won. In this battle, Vecto faces Nixon from the story Hadis by ViktoriaRay. You can see the rules by clicking on the first link, so I won't go over them. ViktoriaRay was busy this week and didn't have time to write her story, so Vecto wins by default and moves on to the finals. I'm predicting the final battle will be between Vecto and Sigma from Sigma/Star by Nick Uskoski, who organized the tournament. Here is the tournament lineup: http://challonge.com/UHHBM1. You've likely heard about comedian/actor Robin Williams' unfortunate death. Like many people, I enjoy watching his movies and shows and was shocked to hear about his death. In honor of his life, I'd like to highlight his contribution to the science fiction community since that's where he got his big start in showbiz. Williams had his break into popularity when he played the alien Mork in Happy Days. 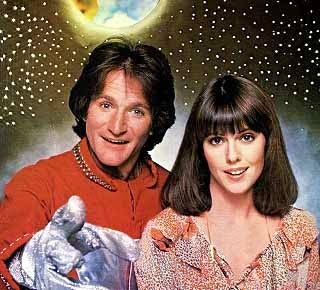 The character was so successful that he got his own show called Mork and Mindy . He also hosted the TV movie E.T. and Friends: Magical Movie Visitors (1982) and played as Professor Philip Brainard in Flubber (1997). In addition, he showcased some of his comedic talents as the voice of Fender in the animated movie Robots (2005). But he's also played more serious roles. Although his role as the voice of the hologram Dr. Know from A.I. - Artificial Intelligence (2001) may be a stretch, he played in a serious role as Alan Hakman in The Final Cut (2004). In memory of Robin Williams, here is a quote from his Andrew character: "I try to make sense of things. Which is why, I guess, I believe in destiny. There must be a reason that I am as I am. There must be." Here's where you can buy the episodes: Robotech: The Complete Set. My character Vecto is participating in a fighting tournament on Wattpad called Ultra Hyper Hero Battle Mark I. It's organized by Nick Uskoski (author of Sigma/Star). Vecto will battle characters from other writers in a fight to the death (or destruction) in a virtual reality setting. The rules are that I will write fight scenes with Vecto losing while my opponents will write separate fight scenes with my character winning. The audience will then have two days to vote for the winner after each round. The character who wins will move on to the next round (not the author). This means that in order for Vecto to advance, you need to vote for the fight scenes (on Wattpad) created by my opponents! You can always comment on my fight scenes (please do) without it affecting the results. 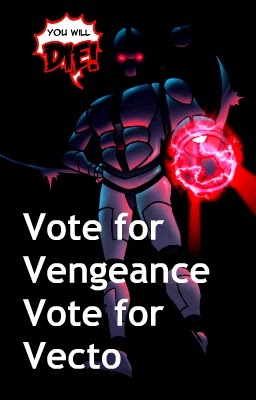 After the tournament is over, you are welcome to vote for my fight scenes if you like them. The first character Vecto that fights is Reiji from Brooding Guy, Quite Girl created by TheBloodEdge. Click here to read his story and vote for it (you will need a Wattpad account to vote). You can read my story here or just read below for the whole story. Here is the tournament lineup: http://challonge.com/UHHBM1. Below is my story. Admittedly, it was difficult to write because I wrote it in Reiji’s point of view, a character I just recently read about. "First person" isn’t my favorite, either, but I wanted to capture the feel of his story. Here's where you can buy the series: Cowboy Bebop Remix: The Complete Collection (Anime Legends).